Synopsis: Sadie has a huge imagination. The days are not long enough for Sadie because she has so many things to make, do and be. She likes to make boats of boxes. She chats with birds, builds things, and has wings that can fly her anywhere. She has been a boy raised by wolves, lived under the sea, and been the hero in fairy tales. Sadie likes stories best because she can make them from nothing at all. Sara O’Leary has written an endearing story that encourages girls to try everything and be who ever they want to be. Sadie is irresistible. 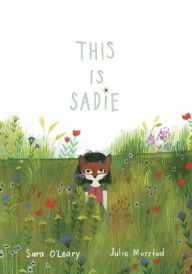 Her story is rich in imagination and will inspire many little girls to find their own “Sadie” within. I also appreciate that many of Sadie’s adventures and undertakings are non-gender specific. How fun would it be to build a contraption with a hammer and nails or be a boy raised by wolves? If you begin to think like Sadie, the possibilities are endless. And being yourself is pretty special. The text is sparse, encouraging children to think outside the box. I am always drawn to books that inspire and celebrate a child’s imagination — especially when so many kids are plugged into gadgets. Julie Morstad’s illustrations are lush and magical. They beautifully capture Sadie’s story. Resources: Give your child several big empty boxes to play with. Fill other boxes with non-gender specific dress-up clothing, toys and art supplies. Many of Sadie’s adventures may be related to her reading stories like the Little Mermaid, Alice in Wonderland, and Jungle Book. Teachers and parents can use these books to jump-start a discussion about favorite stories and characters. Posted on November 27, 2015 by Patricia Tilton •	This entry was posted in Imagination, Perfect Picture Books, Sara O'Leary and tagged Creativity, Imagination, Inspirational. Bookmark the permalink. Another wonderful book. Little girls need to find their Sadie. I have quite a long list of books to buy for Christmas gifts now. Sadie has such an exceedingly huge imagination. You can’t help but want to follow her. Thanks for the RT. I’m not on the couch. I’m in Mom’s car going to breakfast with her. She will share bacon with me. Wait. What? Ugh. Turns out I AM on the couch….. Very sweet Cupcake. You can’t give up imagining. Maybe she’ll take you to the cupcake store too for a special treat. This sounds like a wonderful book, full of the limitless possibilities that, with support, kids can explore and enjoy through play. I remember gifts I’ve given my children when they were very young that brought them endless hours of fun – through the giant boxes they came in! Thank you for your thoughtful comment. I remember loving big boxes and imagining the day away. Such a good thing for kids. How sweet! I really like the sounds of this book. Sarah O’Leary did such a beautiful job with this story. It is packed with imagination. What a fun story! So imaginative and what a wonderful way to encourage readers to think out of the box. Yes, I like the idea of encouraging kids to think outside of the box. I had this lined up next! Ha! Of course we are bound to wantvto share some of the same books, and this time for the same reasons. I wanted to be Julius Irving, my favorite basketball player, when I was Sadie’s age! I wanted to be Pippi Longstocking. Go ahead and review this book, I’m sure the author would be happy. Since there is no “linky” today only a fewer will see my review. Mee too! This is such a fun story! I love a book that lets your imagination set out on many adventures. Sounds like a great read. Terrific review, Pat. Thanks Robin. I just adored this story! So much fun to pretend. Love the imagination! Will definitely read this one. I am on awe of writers who can tell a story with sparse text! So commonly seen in autho-illustrator books, but This is Sadie has both author and illustrator. Yes, I am too — and contain all of the required elements of a story. I do believe that it is easier if the author is an illustrator. This is a wonderful story. Sadie sounds as busy and imaginative as my granddaughter. Lovely theme. I bet your granddaughter is brimming with creativity and imagination! Kids need more books like this, so I am glad that this book is done so well. Yes, it is an excellent book for young children who love to pretend. And it’s gender neutral.